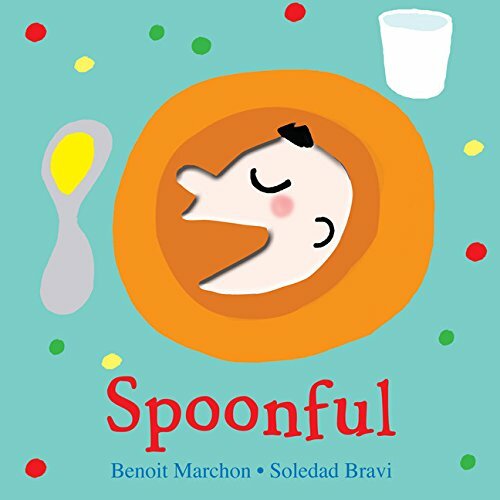 Parents have been known to employ myriad tricks to get their infants to eat, but author Benoit Marchon’s new board book Spoonful may make those tricks a thing of the past. On page one of Spoonful a very hungry baby is instructed to “open wide.” The baby can see a table with an interesting assortment of food, an outline of the parent’s head, and an outline of the baby’s head—complete with gaping mouth—ready to gulp down the food. From there, each flip of the page reveals a hungry character with a gaping mouth ready to eat a spoonful of the baby’s food. On the first few pages, the characters are familiar members of the family, but as the book wears on, there are silly figures standing with mouths open, just begging to eat. There’s an astronaut, a fly on the wall, a worm in the dirt, and even a dinosaur. It is also constructed with a unique twist: Each page has a cut-away outline of the baby’s head and open mouth. The characters on each page wear different clothes or are featured in different settings (e.g., daddy rides in a car, the fly flutters in the air, and the astronaut floats in space), yet the outline of the baby’s little round head and gaping mouth always replaces each character’s head. Even the worm protruding from a potted plant’s dirt is topped off by . . . you guessed it, the baby’s head. Aside from this relentless subliminal message—that it is baby who is hungry and baby who should be eating—these diverse and seemingly random pictures actually help baby to identify who/what each character is (daddy, mommy, astronaut), what each character does (mommy plants flowers, firefighters fight fires), and where each character may be found (worms like dirt, fish swim in fishbowls). In addition to being just plain fun, this creative book should be great at whetting an infant’s appetite for food—and his appetite for books as well.